Minister of Works, Municipalities Affairs & Urban Planning, Eng. Essam bin Abdulla Khalaf presents the Smart Finance Solution award to Batelco Senior Product Marketing Manager Ameer Nasralla and CEO of AFS FinTech Business, Mr. Shiraz Ali. 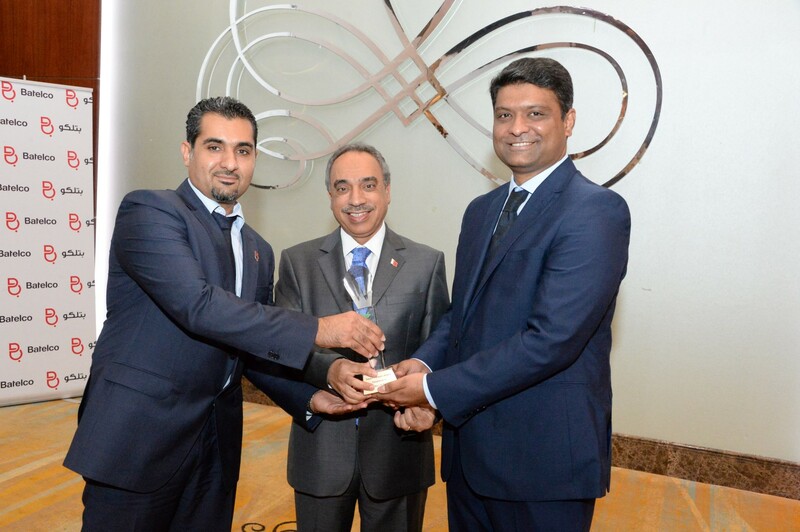 Batelco, Bahrain’s leading digital solutions provider and Arab Financial Services (AFS), the region’s foremost FinTech enabler, were delighted to be presented with the Smart Finance Solution award at the Bahrain Smart Cities 2018 Conference which was held recently at the Diplomat Radisson Blu Hotel. The award was presented for bwallet, the Kingdom’s first digital mobile wallet and payment solution, which was launched by Batelco and AFS early in 2018. The service has since been rolled out across leading retail businesses throughout the Kingdom and is being utilised daily by an ever-growing customer base. bwallet users can simply scan a QR code for seamless transactions and enjoy quick, secure and easy cashless payments with exclusive benefits through their mobile phones. “Batelco is pleased with the increase in the number of bwallet subscribers. The bwallet services are not limited to Batelco customers only, and extend to all mobile users from other network carriers in the Kingdom of Bahrain, in an effort to provide digital services to the entire community”, he added. The award was presented by the Minister of Works, Municipalities Affairs & Urban Planning, Eng. Essam bin Abdulla Khalaf and accepted on behalf of Batelco by Senior Product Marketing Manager Ameer Nasralla and on behalf of AFS by CEO of AFS FinTech Business Shiraz Ali. Further information about bwallet and its offers and exclusive cash back promotions can be found by visiting batelco.com. Download the free bwallet mobile app at Google Play or Apple’s App Store.